This Cashel is beautifully situated overlooking Ballinskelligs Bay. We had our first glimpse of the fort from the N70. We thoroughly enjoyed the small walk down the path from the car-park, taking in the splendid views of the bay. The cashel was built in the early christian period as a defended farmstead. It was recently reconstructed. 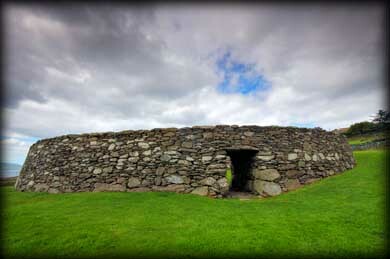 The circular outer walls are over 2 metres high. 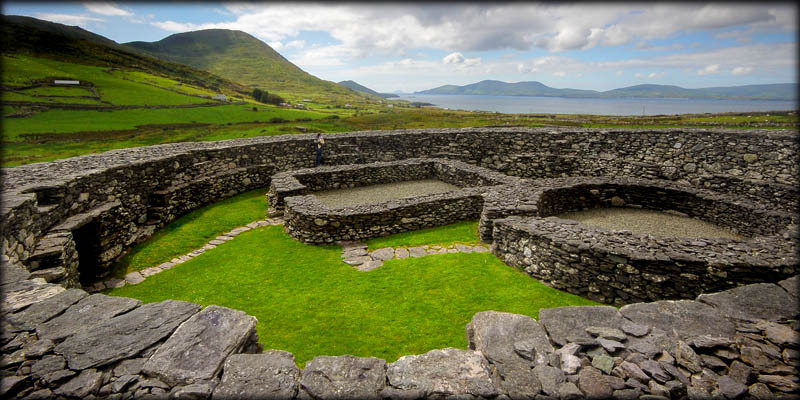 The interior is taken up by large round house and a smaller rectangular house, these were added later and preceded by wooden buildings. During excavations a souterrain was discovered in the circular house but this is no longer accessible. 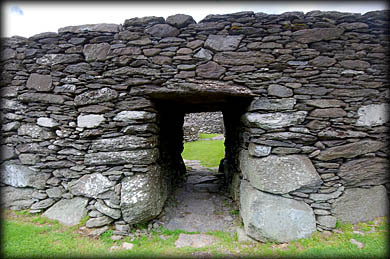 They were used to store food and as a place hide during an attack. Well worth a visit. Situated: Easy. About half way between Caherdaniel and Waterville. At Loher on the N70 there is a gorgeous view looking west over Ballinskelligs Bay. the fort can bee seen in the valley below. Turn left at Ardkeragh and loop back to the Fort. Discovery Map 83: V 5033 6180. Last visit July 2011.